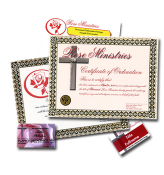 Become an Ordained Minister, officiate wedding ceremonies for friends and family members, or provide services to those in need. The process is simple and quick. Start now. As a legally licensed member of the clergy, you are able to perform religious rites, including marriages, funerals, and baptisms. As a ministry or a business. Simply choose a package to begin. Choose from one of our convenient starter packages to get started today. Enter name exactly as you wish it to appear on credentials, use correct capitalization. 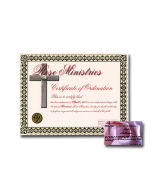 Rose Ministries is not responsible for misspellings or typos - your name will appear on the credentials spelled as you spelled it here! Select the term for your license. Some localities require specific letters of authorization in order to officiate a wedding. 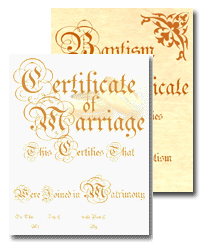 We are aware of specific states which typically require letters in order to register as an officiant. We will include such letters automatically with packages shipped to those states. Due to the additional cost, notarized letters will not be included automatically and must be selected above. Choose a Logo for your Credentials: Your credentials can have either a cross or rose logo. Select requested title, or select Other and enter a custom title below. If you choose "Other" for your Title selection, enter your custom title request here. Governmental titles (such as "Judge" or "Lord") cannot be granted. Disrespectful or obscene titles cannot be granted. Please note, if you plan to officiate a wedding, unusual or extravagant titles can cause difficulties when registering with some county clerk offices. Some localities require a "charter" or sponsorship by an affliate holding a valid charter. If a locality in which you plan to officate weddings is listed, and you wish to be sponsored, select that locality. For details see our FAQ. Hawaii requires a special Authorization Letter in order to be approved to officiate weddings. Select this option is you plan to officiate a ceremony in Hawaii. The City of New York requires a special Statement of Good Standing and a Congregational Authorization Letter if you plan to officiate ceremonies within the City. Select this option if you plan to officiate within the City. Michigan no longer requires a church charter or sponsorship by a chartered church. We will include a Statement of Good Standing and a Congregational Authorization Lettert to all packages shipped to Michigan. A notarized statement of good standing and authorization to solemnize weddings may be required by some counties. Before ordering you may want to touch bases with the county clerk where the ceremony will be held. If you reside out of state, you will require sponsorship in order to officiate a wedding within the state. We have a member willing to sponsor other members. Your Statement Authorization Letter will be mailed to this member for review and his signature. Please allow extra time for this process. If you reside in state, you will need to register with the state. We will include letters required for this registration with your package. Nevada counties have specific registration requirements in order to officiate weddings. NOTE: Nevada law changed as of July 1, 2009. All counties now require a notarized affidavit with your application. You will need to obtain an application from the county clerk, where the wedding will be held if you are from out of state, or from the county in which you reside if you live in state. Complete the application, then send a copy to Rose Ministries either by fax to (708)570-4236 or by e-mail to curator@roseministries.org. When you have the notarized affidavit from Rose Ministries file it, with yourcompleted application, with the appropriate county clerk. We will NOT be able to return the notarized affidavit until your county application is received and reviewed, please allow enough time for this process. We apologize for any inconvenience, however the affidavit signed by Rev. Hall indicates that your application has been reviewed by Rose Ministries. Please allow extra time for this process. If your locality is not listed, we are aware of specific states which typically require letters in order to register as an officiant. We will include such letters automatically with packages shipped to those states. Note that if you are a non-resident where you intend to officiate a wedding, some localities will require verification that you have completed any applicable registration requirements with the state or county in which you reside. For example, if you are from Florida officiating in New York City, the city clerk may require proof that you have properly registered with your county in Florida. As always, touch bases with the county clerk, or other local authority, to ensure you are aware of their requirements. And allow time to meet those requirements. This notarized statement of good standing and authorization to solemnize weddings is required in the District of Columbia. Hawaii requires a special Authorization Letter in order to be approved to officiate weddings. Select this option if you plan to officiate a ceremony in Hawaii. We include these letters automatically with all packages shipped to the state of Hawaii. This notarized statement of good standing and authorization to solemnize weddings may be required by some counties. Before ordering you may want to touch bases with the county clerk where the ceremony will be held. Oregon requires a special Statement of Good Standing and a Congregational Authorization Letter if you plan to officiate ceremonies within the state. Select this option if you plan to officiate within the state. We include these letters automatically with all package shipped to the state of Oregon. Nevada counties have specific registration requirements in order to officiate weddings. For details see our FAQ at http://openordination.org/state_faq.php#%Nevada for further details. One of the letters included is a form letter you must complete and sign before a notary before submitting to the county clerk. NOTE: Nevada law changed as of July 1, 2009. All counties now require a notarized affidavit with your application. You will need to obtain an application from the county clerk, where the wedding will be held if you are from out of state, or from the county in which you reside if you live in the state. Complete the application, then either fax a copy to Rose Ministries at (708)570-4236 or e-mail a copy to curator@roseministries.org. When you have the notarized affidavit from Rose Ministries file it, with your completed application, with the appropriate county clerk. The City of New York requires a special Statement of Good Standing and a Congregational Authorization Letter if you plan to officiate ceremonies within the City. Select this option if you plan to officiate within the City. 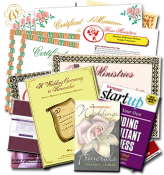 We include these letters automatically with all ordination packages shipped to the state of New York. If you reside out of state, you will require sponsorship in order to officiate a wedding within the state. We have a member willing to sponsor other members. Your form will be mailed to this member for review and his signature. Please allow extra time for this process. Wisconsin residents ONLY. Please note you will need to register with the state prior to officiating a wedding. Please allow time for this process. 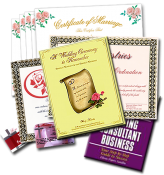 Save by Adding Five Classic Marriage Certificates and Five Classic Baptism Certificates to your package. 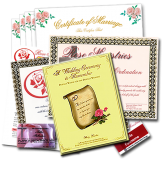 Add Five Classic Marriage Certificates to your package. 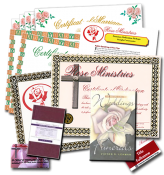 Add Five Classic Baptism Certificates to your package. The Rose Ministries Newsletter's purpose is mainly for urgent announcements that may affect you as a minister, especially wedding ministers. We also send news, updates, and special members-only discounts on offerings that may benefit your ministry. We encourage members to submit pictures, stories, and articles.